The Employee Development Strategy (EDS) uses a five-step approach to minimize skill gaps, increase skill development, and encourage more strategic career development. 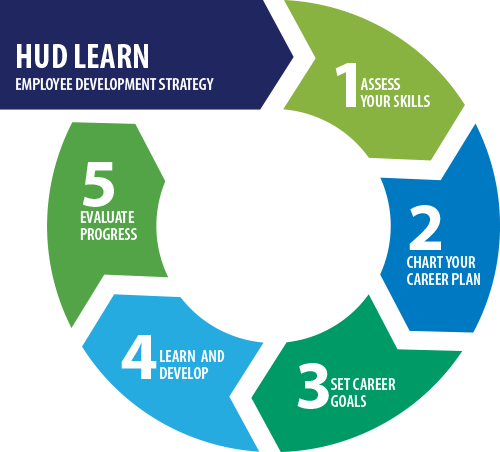 It ensures that each employee's needs and interests align with HUD's organizational goals so that the Agency's investment in learning benefits both HUD and its employees. Step 1 Assess your skills and compare to the Agency's needs and goals. In the first step of the EDS, you will understand the skills and experience that are critical to HUD's success today and in the future, understand your gaps in meeting those needs, and assess opportunities for developing needed skills. Step 2 Identify the right tools for your career advancement. Based on your skills assessment and career mapping tools, you will outline the knowledge, experience, and skills needed to advance your career. Then, you'll determine the best learning and development tools you need to excel in your current position and grow within the HUD organization. Step 3 Make a plan for your professional growth and development. Working together with your supervisor, you'll complete an Individual Development Plan (IDP) and/or a Leadership Development Plan (LDP), which will help you follow your desired path for your professional development and track progress against your professional goals. Step 4 Complete learning activities to build the skills you need to succeed. Besides classroom training, consider coaching, mentoring, structured on-the-job training, rotational assignments, conducting self-study or distance learning, web-based training and webcasts, seeking special projects, or participating on a task force, just to name a few. It's all learning. Step 5 Measure your progress and share what you've learned. Seeking feedback from your supervisor and your team, evaluate how you have applied what you've learned. Check in with your supervisor regularly to update your development plan; report progress; or adjust timelines, goals, and measures.